Yesterday (the 27th), I ordered a whole bunch of stuff for work on the different projects I have. One of the big steps/innovations was the discovery of a little something called Translucent Silicone. This stuff is pimp, and diffuses light like nobody's business. I ordered an engineering sample from Rubber-Cal and got a smallish (2.5" diameter?) circular 1/8" thick piece. The piece itself was probably too thick for what I need, so I ordered 1/16" stuff. The smallest piece I could order from them was 36" wide x 5' long (lengths go from 5' on up). At ~$100 for 15 sq. feet, it's not cheap, but it's great stuff. It's also flexible and slightly spongy, so it opens up many more uses than the acrylic + contact paper I have been using. I also ordered up a sample size of some SORTA-Clear from Reynolds Advanced Materials, which is a liquid translucent silicone, which can be painted or molded/cast into whatever shape needed. This option opens up far more possibilities than even the sheet silicone, as I can make enclosures/balls and edging to satisfy any needs. Simply by carving and dremeling/sanding some pieces of wood, I can get some very simple molds to cast any parts I would need. On a less-exciting, but still cool note, I finally tried out the 3-color LEDs I had gotten a long time ago from Super Bright LEDs. Their output intensity leaves something to be desired (1200, 3700, & 700 mcd for RGB, respectively), the color mixing works wonderfully. I may try using two LEDs per pixel on the cubes, and multiple ones on the sign backdrop, depending on what works. Two should spread out the light fill much better, especially if I need to go with some pretty thick silicone to diffuse it properly. All for testing; I got these to align with the same candella ratios as the 3-color LEDs. If these don't work worth a damn, then I'll just go back and order a bunch more 3-color LEDs and resistors to match the currents. I should get most of this by mid-late next week (Thursday? ), but since Tuesday is a holiday and some places will be short-staffed on Monday, probably not until the following week. Yes, after a very long hiatus, I've actually done some work. 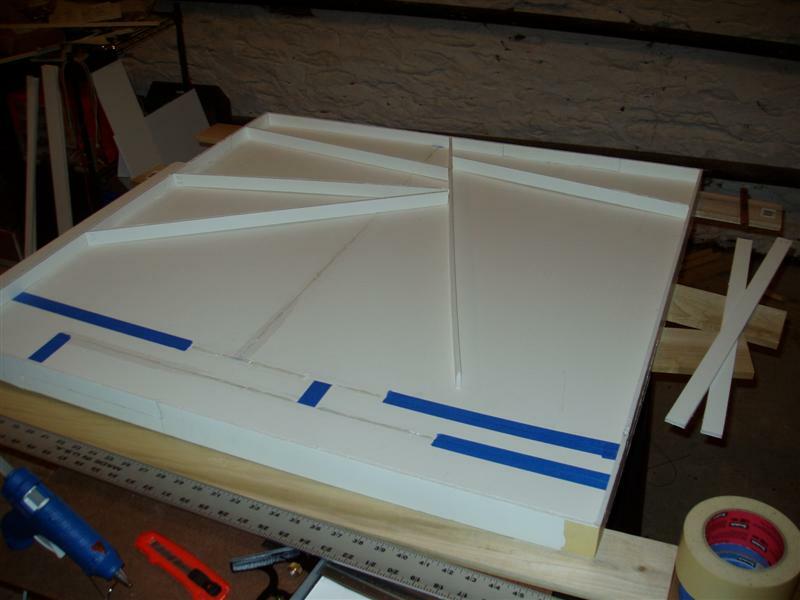 On Tuesday, I spent several hours finishing up the dividers, which included the final steps of slotting several of the overlapping pieces and finally gluing everything into place. Things went really well, and now I've got a 3'x3' box with 20 divisions in it! I would have taken some pictures, but Another Project ended up having me take 2100 pictures over a week and a half period, which um... tested all aspects of the camera. About 2/3 of the way through the shooting, the flash on the camera broke/exploded. It was nothing major; the external glass around the flash was not broken or damaged, but now I have a camera that is minus a flash. I'll get some, I promise! My building owner/super asked for some help with a friend's kid's costume before this Halloween. He wanted to be a Jin Ro (Wolf Brigade) soldier (& here). The building owner was helping him (a.k.a. doing while he watched) with the actual costume, and he wanted me to help with (a.k.a. do) the eyes. I had them get a few parts for it, and they ended up getting a set of red LEDs that were rated for 10 millicandelas. Well, that simply wouldn't do, so I grabbed 4 of my 8000 millicandela LEDs and used them instead. The end result was something that was incredibly bright, but he could still see out them just fine, as the LEDs were forward-pointing. When I get some pictures, I'll post them here for everyone. As promised, I come with pictures! I got a bit more done tonight--mainly alignment & fine-tuning of the locations of the dividers. None of them are placed on any sort of grid or in a regular fashion, so I've got to go just on my small scale drawing. I got 5 pieces cut and placed, out of a total of about 12-14. None of them are permanently placed yet; I'm still fiddling around with different aspects of the entire construction. I've got 3 other pieces cut and sorta placed, too, but they intersect the 5 pieces I've already got placed, so I'm holding off on those until I know better exactly where they're going (by placing all the other non-intersecting ones). 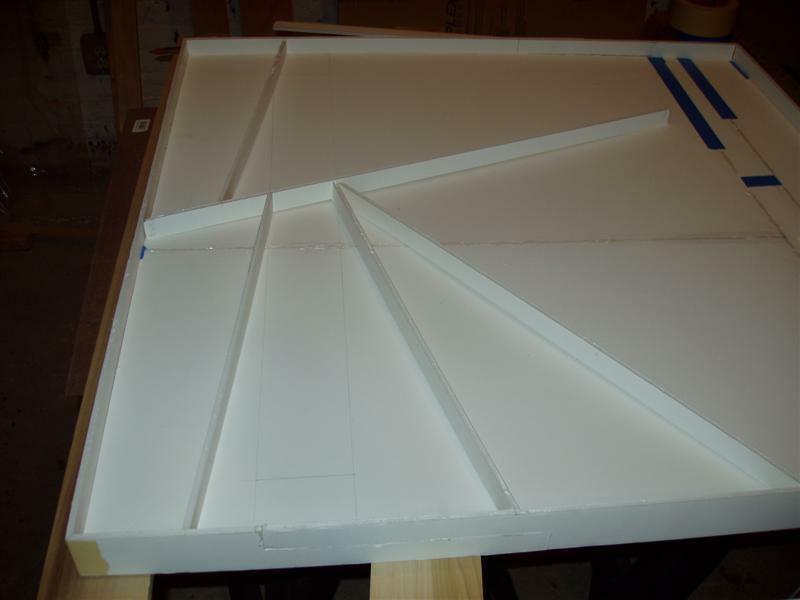 You can see lots of tape and glue seams in the floor of the base; they're there because the foamcore boards I have are only 20"x30" and the sign is 36"x36". Also, I had to sort-of conserve boards, because I was about 1 short from what I could have used ideally. That's why there are all those weirdly-shaped pieces (look at the tape and glue lines). The entire thing is 2" high & the dividers are 1" high. 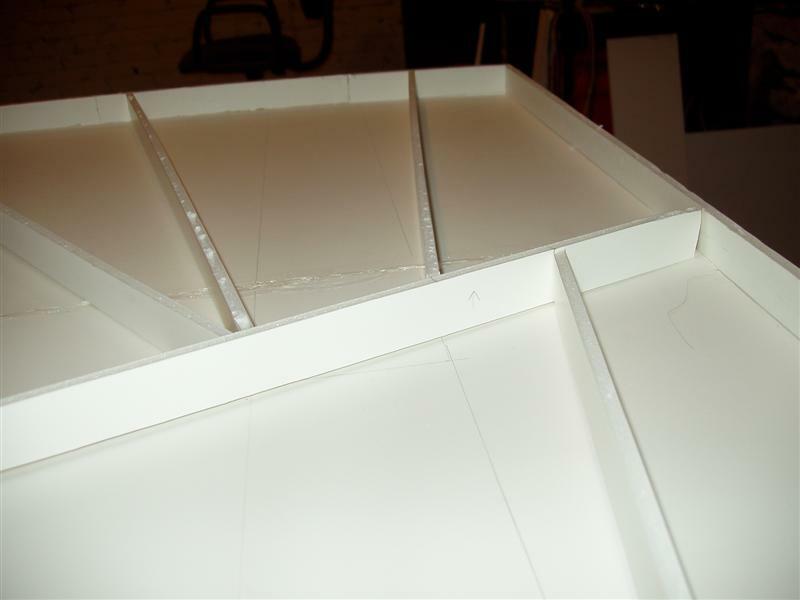 The foamcore is 3/16" thick, leaving me just under 3/4" underneath the floor for the circuitry and wiring. Overall, it's still very, very light and a bit flimsy. Once I attach these dividers, it should stiffen up a lot. If not, and I need to stabilize it more, I can always lay down & glue strips of more foamcore or thin plywood to the underside of it. Well, seeing as how I completely missed July for postings, I feel it necessary to post now before I completely miss August as well, if even just to make a post about nothing. Not much has happened with progress since June, because of several reasons. There was about 2 weeks of vacation and work travel in the middle, I changed jobs, and just have been generally not feeling anxious to work on things during the summer in a studio without air conditioning. It's in a basement, which helps the heat a bit, but it's still quite humid there. Perhaps I'll have to pick up a cheap dehumidifier. However, there has been a little progress. I've been making some headway into the lighted sign construction for Altered Esthetics. Right now, I've got a simple exterior box, and I'm currently working on attaching the floor to it. 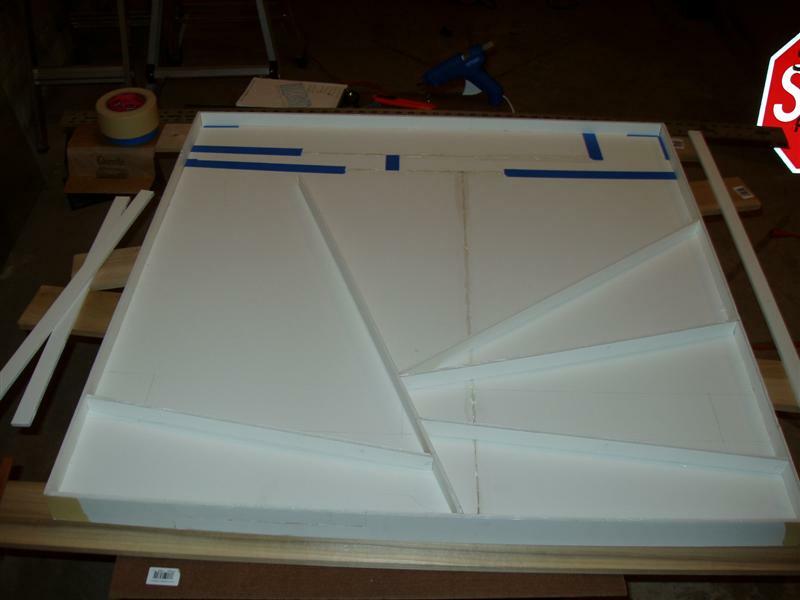 That doesn't sound like much, but the box is 36" square, and the foam core I'm working with is only 30"x20". This leaves quite a few seams to join everything together. For the exterior walls, I used hot glue to attach the pieces to each other. For the joints on the corners, as well as seaming together the interior floor, I've just been using painter's tape. I'll see if something more permanent (or less blue) is going to be required. I hope not, because the tape is really handy. I will get some pictures the next time I work on it, I swear! Sorry for a lack of updates... It's been a very busy month, and I've not had a whole lot of time to work on stuff. Things have finally started slowing down a bit now, so I've started working on a backlighting setup for a sign that Altered Esthetics has. I'm making it with foam core board, so I'm also using it as a test vehicle for how well this stuff will work. In the coordinate plane, a circle which passes through (-2,-3) and (2,5) cannot also pass through (1978,y). Find the value of y.